The art of Roy Anthony Shabla - prints - keys series and blue period series. keys: prints is a series of fine art prints in various media, some with hand-colored details, some in small editions only available from the studio. Each print is one-of-a-kind. 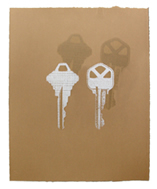 ghost keys is a serigraph produced at Modern Multiples in Los Angeles. It evokes the countenance of low-brow art, simulating cardboard with rough edges, to emphasize the commonality of these objects in everyday life. The image is presented like the figures from American Gothic by Grant Wood. The shadow image (the placement of which varies on each print) is printed with metallic powder and disappears at certain angles of perspective. For more insight into keys: prints, see: excerpts from keys poetry. blue period: prints is a series of letterpress prints with hand-painted watercolor details, each illuminating a different poem. 100% cotton and acid-free paper, each print one-of-a-kind.